Search engine optimization (SEO) has always been key to many including myself. It really is a no-brainer as almost every brand, business or individual would want to be easily searchable across major search engines to stand out from their competition online. 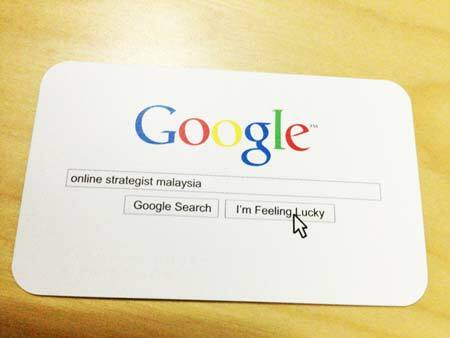 However, can SEO benefit OFFLINE marketing efforts? Definitely. And one reason why SEO can be equally powerful offline is that it demands attention and can potentially increases your credibility curve even if you are new to the industry. 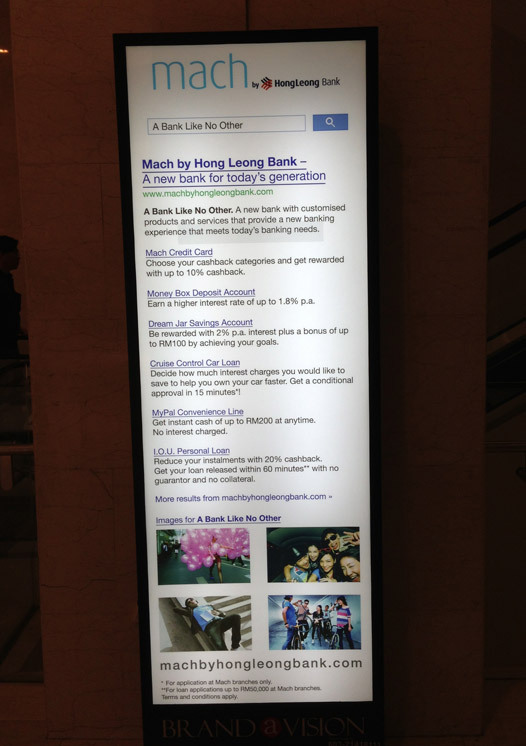 Take for example this advertising campaign by Hong Leong Bank Malaysia I spotted in a shopping mall on their recent launch of the Mach Card (a credit card). What do you think? Did it catch your attention? It definitely did to me! And here’s a vertical version on one of the pillars. This advert caught my attention when I was going down an escalator. Not because of its size but because it resembles Google search. My focus was immediately and naturally drawn to the “search box” effortlessly. 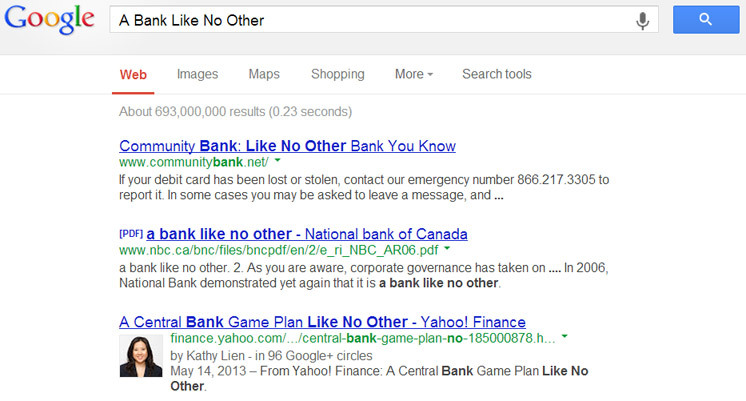 The message was clear and there was a clear takeaway for me as a potential customer – “A bank like no other”. Short, simple and sweet rather than the name of the new product that probably may not make sense. An advert that utilizes familiar elements allows the audience to understand its context without any trouble. And in this era where Google search is dominant, they cleverly adapted their brand to the Google layout that we are all familiar with and listed out the product features as “search results”. One look and just about anyone gets the message. I have personally been utilizing a similar strategy for a while now and I must say it works almost 100% of the time. People tend to go “Wow!” or “This is so cool”, followed by “So what do you do as an online strategist?” and it takes off from there naturally. What makes this method effective is that they would already have generated a certain amount of interest in you rather than you go babbling about what your company does. Starting a conversation is one thing, and actually being on the search results is another. People who receive my card in most cases tend to test it out there and then… and it works! What happened here? You’ve just successfully proven that you are the real thing and will leave a lasting impression on the recipient especially when there are hundreds of cards being passed about. But wait, is the brand for real? A quick search on Google revealed that they are no where to be found! Sure, it did very well in attracting my attention and I remembered your keywords but hey, I can’t find you on Google and mind you, I was genuinely interested in finding out more! So the question really is, what is the purpose of this advertisement? Have you experienced an ad campaign that put you off? I would definitely want to hear your experiences below.